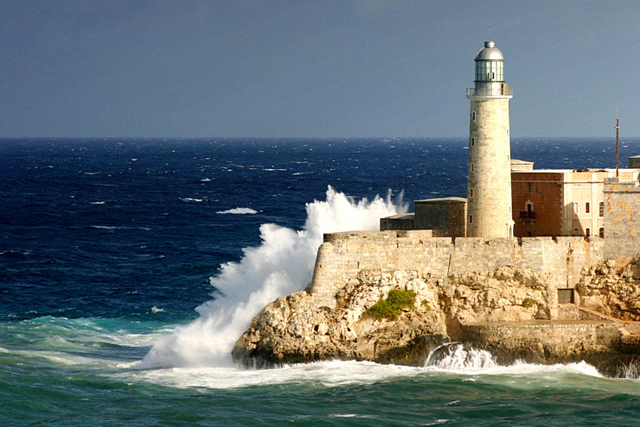 The Morro Castle was constructed between 1589 and 1630 at the tip of a peninsula across the bay from the place where Havana was founded – now Old Havana - and just north of the traditionally Afro-Cuban neighborhood of Regla. The Morro was constructed to guard the entrance to Havana against pirates and other colonists eager to gain control of this strategic transit hub between Europe and the rest of the Americas. Today, the fortress can be reached via ferry or by looping around the bay over land. The castle’s unusual shape hugs the rocky cliffs of the bay, with thick, imposing walls, a moat, and a stoic lighthouse that can be seen from the city. While the strength of the castle was tested on many occasions, it was unable to withstand an attack by the British in 1762, when they took control of the Morro, and thus over Havana. While a year later, Havana was returned to Spain, King Carlos III promptly ordered the construction of the San Carlos de la Cabaña Fortress to ensure that no such event would ever occur again. Construction on La Cabaña began the following year, and it became the largest Spanish colonial fortress in the Americas, covering an area of nearly 25 acres. No visit to Havana is complete without a trip across the bay to visit this expansive historical complex. Today, sight-seers can experience much more than just a guided tour of a centuries-old structure. The two castles house a wide range of experiences, making them a great destination no matter what time of day you come, or how much time you have. In the Morro, you can visit the Maritime museum, which documents the 1762 British attack of that very complex. In recent years, the castle also has taken on a new role as an exhibition space, where various artists both create and exhibit their art. The complex is also spotted with artisan stalls and small stores of all types, so it’s a great place to get in some of your souvenir shopping. In the Cabaña, you can learn about how the fortress has been used across the centuries. Under the dictatorships of the first part of the 20th century, the fortress served as a military prison. After the revolution, Che Guevara occupied the space, a time that is documented in the Museum of Che’s Rule, which is also housed here. If you stay at the Cabaña after dusk, you will be joined by another wave of tourists, arriving to attend the famous cañonazo ceremony. This nightly ceremony reenacts an 18th century ritual of sounding a canon to signal the closing of the city walls. Although the city no longer fears attacks from pirates or other opportunistic colonial powers, every night at 9pm, Habaneros in full Spanish military regalia continue the tradition. What is great about the Morro is that it has something for everyone. It is an inspiring stop on any visit to Havana, and can be appreciated on a quick whirl, or savored slowly over an entire day. By far my favorite way to enjoy the Morro is at sunset. You can sit on the massive old walls of the castle and ponder the power of this Caribbean jewel under Spanish rule. You can listen to the crashing of the sea against the ocean wall and watch the lights turn on as the sun sinks slowly over Old Havana. You can snap some stunning shots of Havana’s skyline absorbed in purples, pinks, and orange. It is a breathtaking experience, and absolutely worth the trip. Experience the magnificent El Morro de Castillo across the Bay of Havana on a visit Visit Havana Vieja on one of our Cuba Tours such as the the Undiscovered Cuba Tour. Cuba remains one of the safest destinations for travel. All insightCuba tours are scheduled to depart as planned and we look forward to sharing everything we love about Cuba.